Too Fly Productions is excited to announce a new and improved version Little Miss Glitz, complete with brand spanking new, original music written locally by Christopher King. Dust off those tiaras, get your spray tans on and practice those cupcake hands because this show is going to be off the hook! Production Dates: March 22 – 31, 2018 at Performance Works, Granville Island, Vancouver. Actors should also be available from April 4 – 8,, 2018 for a possible short tour of the production. Rehearsals: 3-4 days a week from February – March, 2018. Audition Date: September 30 (evening) and October 1 (morning), 2017. Callback Date: October 7, 2017. Audition Location: Downtown Vancouver. Address will be sent to actors once chosen for an audition. 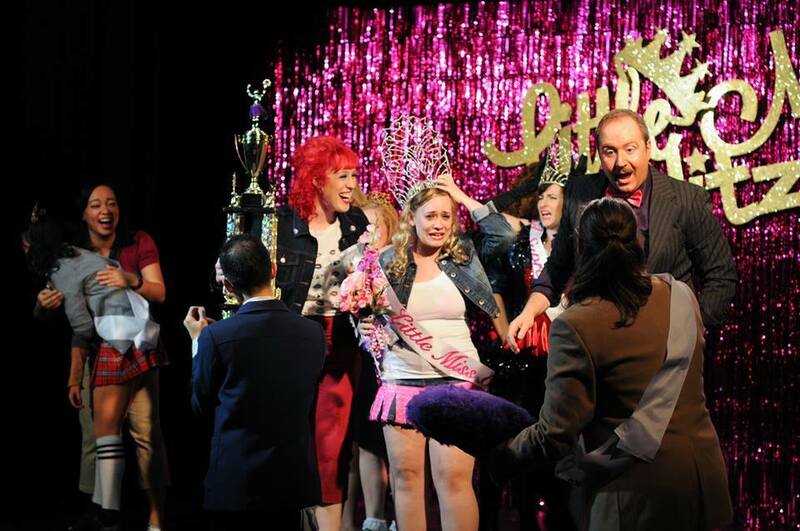 Synopsis: Little Miss Glitz sets the questionable beauty standards and parenting practices of child beauty pageants to music in a high-energy musical with a twist: there is no scripted winner. Each night, a panel of judges pulled from the audience will determine who wins, leaving the cast to improvise the end of the show. Adding to this element of surprise is a heartwarming story of Isabella Connor, a frumpy and impressionable 7-year-old, as she navigates through the world of child beauty pageants. While at first pageants seem like a fun way to dress up, have fun and get a foot in the door of stardom, Isabella soon discovers that the cutthroat world of pageants takes no prisoners. You have to fight to survive. Note: To enhance the satire of the show, all parts, including those written for children, will be played by adults. Isabella Connor (F) – A frumpy, impressionable and unseasoned 7-year-old who dreams of becoming a star, but doesn’t quite have the ingredients to get there. Jaylene Darlene (F) – A highly competitive 6-year-old with an A-type personality. She is the most competitive child-contestant and wants to win at any cost. Carol Wood (F) – A sickingly sweet and terminally delightful self-proclaimed “pageant mom” and mother of Sparkle. Stefan St. Claire (M) – A snooty and flamboyant 30-year-old pageant consultant who is hired by Jaylene to help her win. Submission Deadline: September 15, 2017. To submit for an audition, please send your headshot and resume to Alan Pronger at alan@toofly.ca. If selected for an audition, you will be asked to prepare a musical theatre song and comedic monologue, as well as an additional musical theatre song if requested at the audition. You should also come prepared for a dance call after you sing with appropriate dance shoes and clothing. Please allow at least 2-3 hours total for your audition. This is a profit-share production, because artisits deserve to be paid when money is made. Too Fly is an equal opportunity theatre company and encourages submissions from artists of all cultural backgrounds.